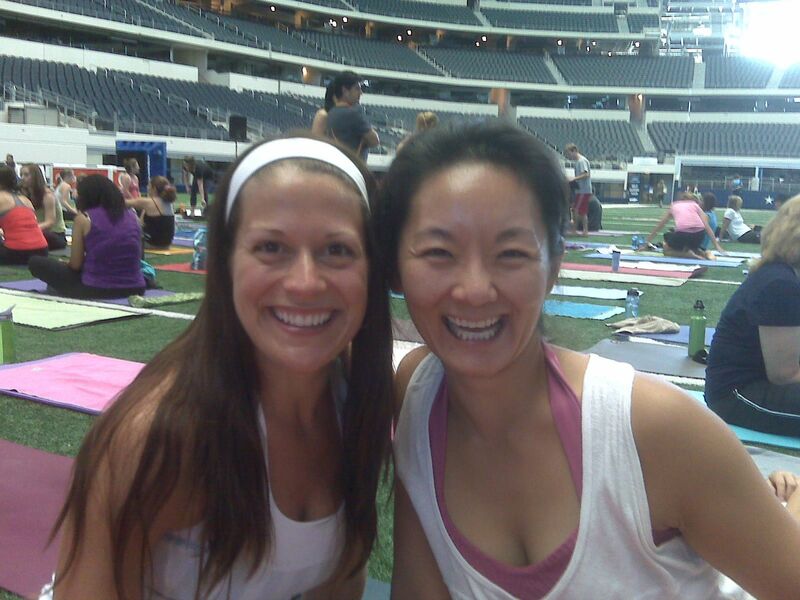 More than 400 DFW Metroplex yogis came together yesterday to create a fantastic display of yogic energy in one of the most amazing structures in the area, the Cowboys Stadium. It was a beautiful display of downward dogs, one legged wheels, eagle pose (though they didn't call it that) and other asanas. We made it to the stadium easily parked and purchased our tickets. We took an elevator down to the field and wow, what an awesome moment, walking onto the field. I had been there earlier in the year, I ran the America's Half Marathon and ran into the stadium. But this was a totally different experience because we got to just walk around. I felt like I needed to take my shoes off but then I remembered it wasn't like the studio and people walked on the field all the time! Indigo Yoga in Fort Worth was the studio leading the class/event and they are a Baptiste Yoga affiliate so the class was not Bikram Yoga postures so I was peeking at Karen, our studio owner and those in front of me for hints on what to do. I know what downward dog is but I haven't done it or upward dog for that matter in years. It took me a few times to get the flow of downward dog to upward dog. And some of the postures, although similar to Bikram Yoga weren't exactly like them and it appeared there were several variations, or at least that people were allowed to sort of "do their own thing". At the end we did some odd crunches, oblique work and crossing of the legs, not sure that was yoga but I thought heck, it never hurts to do ab work! Karen and me, hanging out on the field! It was a great time and a good experience. Hanging out with other people from the studio was so nice too, it gave us all a better chance to get to know each other. Not sure that type of yoga is for me, I like to struggle more and really sweat it out so I "feel" like I am accomplishing something. I am sure it is all mental. They indicated they will continue to do the event so next year should be even bigger. It will be awesome to see the whole field full of yogis, moving all together as one, sharing energy and growing all at the same time. Until then, keep stretching upward. I had the bag, had to buy the car. Why is my laundry still piled up in the corner?